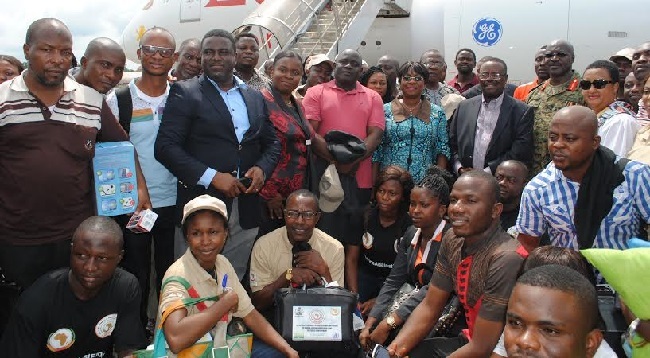 Seventy four (74) Nigerian nurses and doctors arrived in Liberia on Friday to beef up the African Union’s Ebola response in Liberia. The Nigerian healthcare workers, predominantly female nurses, are to staff Ebola Treatment Units (ETU’s) in Liberia’s interior, where there are pockets of outbreak of the deadly disease. Major General Dr. Julius F. Oketta, head of the African Union Support to Ebola in West Africa (ASEOWA) said the Nigerian team’s arrival is in continuation of African solidarity. He said member-states have resolved to fight Ebola in the three worst affected countries of Guinea, Liberia and Sierra Leone. Maj. Gen. Dr. Oketta said the team was in Liberia to respond to the new trend the virus has taken in Liberia from the capital, Monrovia to towns and villages in the country’s interior as well as strengthening its public healthcare system. “We have so many hotspots of Ebola and we are going to head to these hotspots right away across the country”, the ASOEWA Head of Mission remarked. Dr. Oketta disclosed that the medical team is not only here to fight Ebola but to also reinforce the public health services in Liberia. He named the John F. Kennedy Hospital in Monrovia, where AU Mission has deployed six doctors while revealing more doctors from the arriving team will join six others already there to work in other critically needed areas. “What the government wants is what we want; to make sure the speed of the disease of the infection and, eventually the disappearance must be enhanced by deploying more personnel”, Major Oketta stated. Also on hand to welcome the team of Nigerian medical personnel at the Roberts International Airport were Nigerian Ambassador to Liberia, Chigozie Obi-Nnadozie and Liberia’s Chief of Protocol Rufus Neuville, among others. Ambassador Obi-Nnadozie said she was excited to receive the team and disclosed that Nigeria is not only making financial contribution but human resources too. “I want to thank you all for volunteering to help our brothers and sisters here in Liberia and help the government and people in general. This is the African spirit you are showing, this is the Nigerian spirit”, she said to the team. Meanwhile, the Nigerian Embassy on Friday evening held a welcome reception and dinner in honor of the medical team. Speaking at the dinner, Liberia’s Foreign Minister Augustine Kpehe Ngafuan welcomed the team and expressed gratitude on behalf of President Ellen Johnson Sirleaf, the government and people of Liberia to Nigerian President Goodluck Jonathan, the government and people of Nigeria for the solidarity Liberia has received from Nigeria. Minister Ngafuan stated that the occasion was unique because Liberia was welcoming Nigeria’s health personnel. He stated that because of the political and military security problem Liberia faced in the past, Nigeria still has peacekeeping forces in Liberia which have been helping to keep peace on the security front. Foreign Minister Ngafuan revealed that the Federal Republic of Nigeria has one of the largest deployments of personnel here to help keep peace in Liberia. “Greater love has no man than the one who lays down his life for his friends”, said the Liberian Foreign Minister. “Nigerians laid down their lives for Liberia during the Liberian civil crisis and today Nigeria is here with a health keeping force to help us fight this deadly Ebola virus. Nigeria is coming to us while others are leaving us, this is evident of true partnership” Minister Ngafuan stated amidst applause from the audience attending Friday’s colorful event held in Congo Town outside Monrovia. The foreign minister stressed that most Liberians have died from other curable diseases because of Ebola and Liberia will be grateful for every life that will be saved by the Nigerian health team. He added that every death is a Liberian death and every life saved is a Liberian life. Minister Ngafuan informed the Nigerians that by next week he will be at the ECOWAS Summit in Abuja, Nigeria where he will have the opportunity to express the gratitude of the Liberia to Nigeria on Nigerian soil. Earlier at the dinner, Nigerian Ambassador Obi-Nnadozie expressed her delightfulness for the gathering to celebrate a milestone in Nigeria-Liberia relation. Several members of the cabinet were in attendance at the welcome dinner including the Ministers of Internal Affairs, Gender, Agriculture and former Education Minister Etmonia Tarpeh, among other high profiled guests. Similarly, neighboring Sierra Leone expects to also receive a Nigerian medical team of 100 personnel to serve under ASEOWA to combat the virus. In a related development, the Economic Community of West African States (ECOWAS), through its health body the West African Health Organization (WAHO), has deployed a thirty- nine (39) person- strong medical team to Liberia to help the country battle the deadly Ebola Virus. 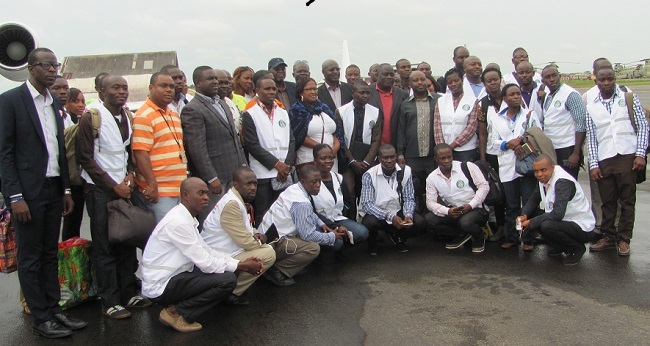 The ECOWAS Medical Team which is headed by Dr. Kabba Joiner arrived in Liberia on Sunday on board a United Nations Aircraft at the Roberts International Airport. The team consists of 10 medical doctors, 17 nurses and 12 specialists in different medical areas. Medical personnel from Ghana, Ivory Coast, Niger, Mali, Benin and Nigeria make up the ECOWAS contingent. The ECOWAS Medical team will work under the supervision of the African Union Support to Ebola Outbreak in West Africa (ASEOWA) under the leadership of Major General Dr.Julius F. Oketta. Receiving the delegation at the RIA, Major General Oketta said the mission is a joint AU-ECOWAS civil military response operation to the Ebola outbreak in the region. Dr. Oketta disclosed that the mission of the joint AU-ECOWAS initiative is to work on the following pillars: medical and non medical, dealing with the Ebola Treatment Units and surveillance ,humanitarian support to distress communities, physo-social support and social mobilization, communications and coordination and collaboration with partners in the fight against Ebola. “All of us from the African soil have come here in support of government’s effort in eradicating Ebola, I normally use the word eradication because we don’t want to suspend Ebola, we must finish it robustly and therefore we are here to ensure by the time we stepped on the ground Ebola must be declared finished that is our spirit”, Major General Dr.Oketta told the medical personnel. He urged the medical personnel to serve as not only ambassadors for their respective countries but also for ECOWAS by showing love, care and support for people in the communities where they will be assigned. For his part, the head of the ECOWAS Medical team, Dr. Kabba Joiner said he was glad to be in Liberia and to make a contribution to raid the West African sub-region of the deadly Ebola virus. Dr. Joiner said the team was carried through the entire basic preventive training and skilled through the steps in treating Ebola victims. “We are here to work directly with the AU Mission, the Ministry of Health and other partners to ensure we win this war. My team hopes to be deployed to wherever the authorities in Liberia decide and will work in all terrains”, he said.